One of the highlights of the dive, a dumbo octopus uses his ear-like fins to slowly swim away – this coiled leg body posture has never been observed before in this species. Image courtesy of the NOAA Office of Ocean Exploration and Research, Exploration of the Gulf of Mexico 2014. Download larger version (jpg, 1.0 MB). Watch video of the octopus. The maiden dive of the new Ocean Exploration Command Center (ECC) at the Cooperative Institute for Ocean Exploration, Research, and Technology (CIOERT) at Florida Atlantic University Harbor Branch was a success. 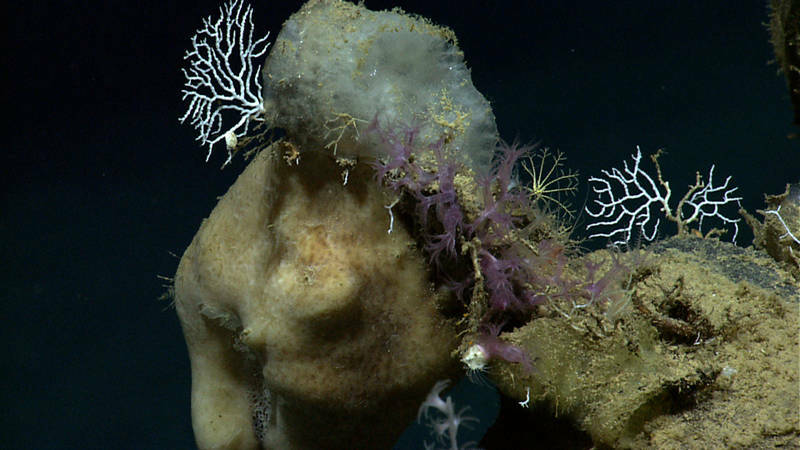 A diverse crew, including students and scientists, seasoned deep-sea explorers, and novices like myself came together to explore the Many Mounds Area of the West Florida Escarpment in the Gulf of Mexico. Corals, sponges, and crinoids – oh my! The yellow crinoid in the middle is likely a juvenile Monachocrinus caribbeus. Image courtesy of the NOAA Office of Ocean Exploration and Research, Exploration of the Gulf of Mexico 2014. Download larger version (jpg, 1.6 MB). As a marine botanist, or one who studies plants that live in salt water, deep-sea exploration is outside my typical scope of work because it is below the photic zone (zone in the ocean where light penetrates). My previous experience with deep-water organisms is limited to the exploration of “deep-water algae” or more appropriately “mesophotic algae” from CIOERT’s 2010 Florida Shelf Edge Exploration . A crinoid - potentially a new species in the Family Thalassometridae - clings to a black coral. Image courtesy of the NOAA Office of Ocean Exploration and Research, Exploration of the Gulf of Mexico 2014. Download larger version (jpg, 1.7 MB). During that cruise, I descended to the depths of 65 meters in Harbor Branch’s Human Operated Vehicle Johnson-Sea-Link II (JSLII) to observe a field of the deep-water green alga Anadyomene menziesii. As a student, the chance to go to sea and go down in the JSLII was an opportunity of a lifetime. The current expedition of NOAA Ship Okeanos Explorer with its remotely operated vehicle, Deep Discoverer, is bringing opportunities like this to countless numbers of students and providing critical training to the next generation of deep-sea scientists. At the Harbor Branch ECC there are three other graduate students, all from Dr. Joshua Voss’s lab, who are assisting with data gathering and documentation of each dive, which will help in the program’s research. Yesterday’s dive started at approximately 2,200 meters and progressed up a vertical rock ledge to 1,960 meters. Light levels at these depths are well below the requirements necessary for photosynthesis, so I was not expecting to see any plants. However, we did see an incredible array of animals ranging from holothurians and ctenophores to corals and sponges. We saw numerous examples of the unbranched bamboo coral, a type of deep-water ocotocoral belonging to the Family Isididae. 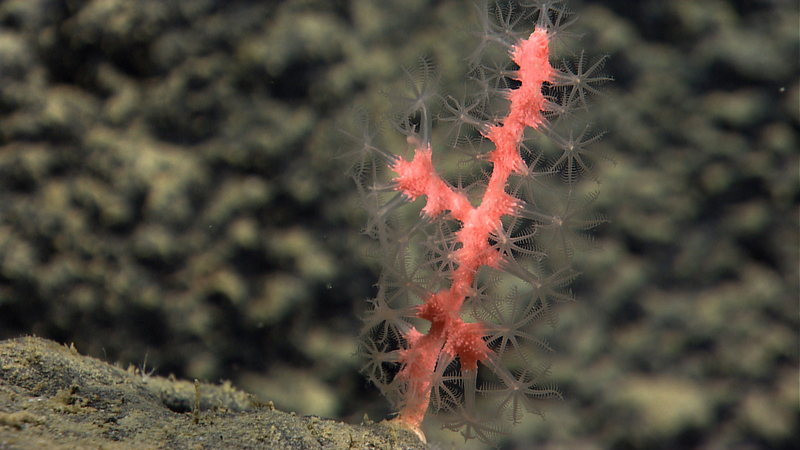 In addition, we saw a bright pink coral we called “bubble gum” coral due to its color that most likely belongs to the genus Paragorgia or Sibogorgia. An exciting part of this dive for our coral fans was the amount of coral recruits (including this small, baby bubblegum coral) seen during the dive. 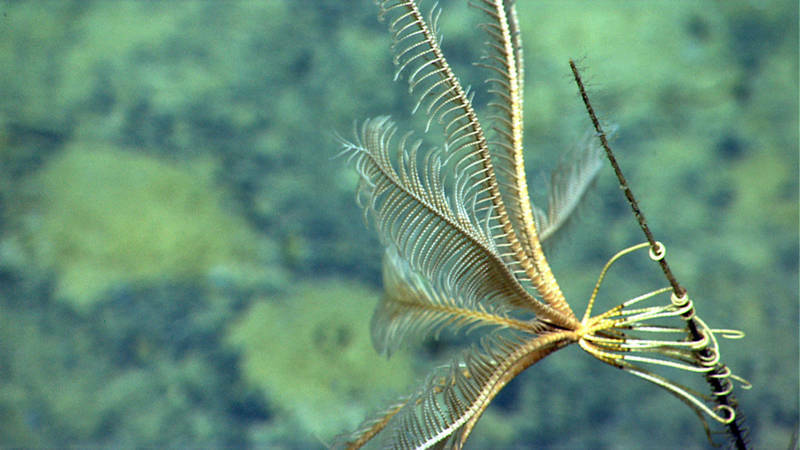 Image courtesy of the NOAA Office of Ocean Exploration and Research, Exploration of the Gulf of Mexico 2014. Download larger version (jpg, 1.2 MB). The highlight of the day for me was the dumbo octopus we saw hovering above the surface of the rock ledge. 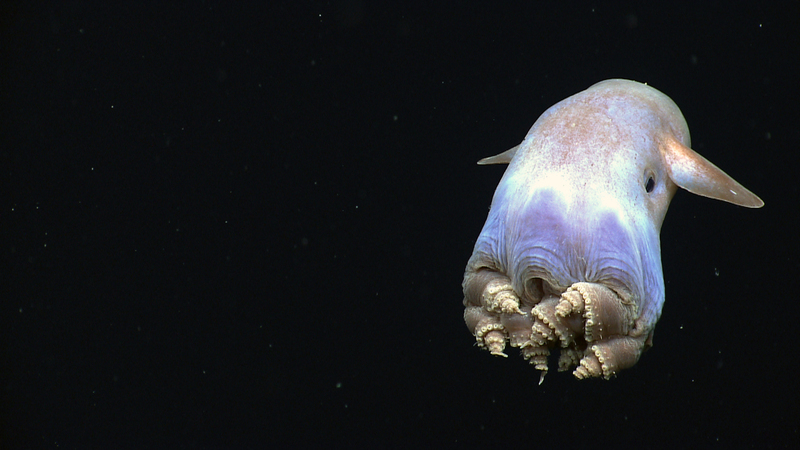 This beautiful creature belongs to the genus Grimpoteuthis and has ear-like fins protruding from the upper part of its mantle that resembles the ears from Walt Disney’s Dumbo, hence its name. Our dumbo was seen with its legs coiled – this body posture has never been observed before. It will be interesting to see what else we discover in our explorations over the next few days!